It was 1944. The Allied Air Force continued to rain bombs down on Germany with devastating power. In retaliation, the Luftwaffe hatched the Steinbock attack, a series of full-scale night bombing raids over London and the English mainland, that would involve over 400 bombers such as the Junkers 88, Dornier 217, and Heinkel 177. The interception of these massive aircraft, although difficult due to their high sped and low visibility, was largely entrusted to the Mosquito Night Fighter NF Mk.XIII and NF Mk.XVII variants. It was in 1941 that the RAF began development of a night fighter version of the all-wood Mosquito. The first was the NF Mk.II, which was equipped with an Mk.IV Airborne Intercept Radar on the nose. However, its limited range at low altitudes proved problematic versus the low altitude, high speed attackers. 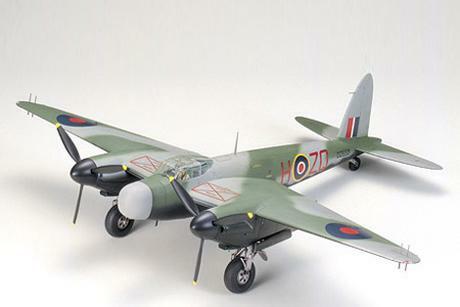 For this reason, the Mosquito NF Mk.II came to be equipped with a new centrimetric radar known as the A.I. Mk.VIII. The official designation of this aircraft was NF Mk.XII. The new A.I. Mk.VII radar was also fitted to an airframe based on the Mosquito FB Mk.VI, inside a "bullnose" radome on the nose, resulting in gallon drop tanks, and was powered by two of wither the Merlin 21 or 23 engines. The sting of this Mosquito came from four 20mm Hispano Cannons installed just under the nose. Later, the lightweight and improved American-made CR-720 radar was mounted on the NF. Mk.XVII version of the Mosquito, which would enter air combat soon after.